My favorite business books are those that make me feel as though I’ve just had a chat with the author, learning a little about him while also learning more about the topic. Shawn, who I met several years ago at a Pittsburgh Podcamp, has written a nearly perfect guide to blogging and seasoned it with plenty of personality. His book is short and to-the-point, but comprehensive enough so that if you’re thinking about starting a blog for your business, you won’t overlook anything. After an hour with this book, you’ll understand why blogging is important, how to plan content and create a writing schedule, how to choose the write blogging platform, how to create your writing voice and how to let people know about your blog. And if you’re uncertain about what to write about or unsure about your writing skills, Shawn has encouraging words to get you past those obstacles. He’s also added some of his great tips on how to find images to enhance your posts. The book also includes plenty of examples from Shawn’s own blog at ShawnGraham.me, and each chapter ends with “stone cold” takeaways as review points. Through the book, Shawn remains focused on the blogging end game — build your business. He constantly reminds his readers to keep their audiences in mind and to include calls to action (subscribe to my email, download this white paper, call for an appointment) in and around their blogs. He’s even got a few of those in the book. 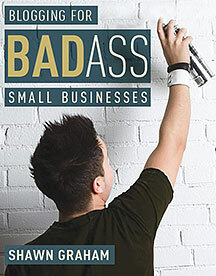 Shawn’s own conversational writing voice makes the book an easy read, and by the time you’re done you’ll be ready to start creating your own badass blog. Social media websites can be dangerous places for public figures, institutions and businesses, especially when they make mistakes. There’s always somebody on Facebook, Twitter, Google+ or on a review site like Yelp or Angie’s List who’s ready to point out problems and mistakes. Depending on your response, you can make the problem worse, damaging customer relationships in the process. 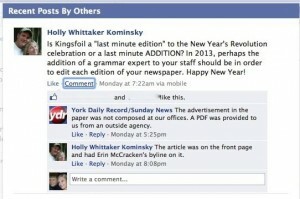 My sister, being a grammar lover and sister of journalist, posted a message to the YDR’s Facebook page pointing out the error and added a bit of snark (sorry, Sis), by writing, “In 2013, perhaps the addition of a grammar expert to your staff should be in order to edit each edition of your newspaper. Happy New Year!” A screenshot of her post, as well as the YDR’s response is over there to the right. After my sister answered that she had seen the incorrect spelling in an article, not an ad, there was no further comment from the newspaper. Just about every social media expert will tell you the newspaper’s Facebook administrator dropped the ball on this one. When a customer points out an error or problem in public — like on Facebook — it calls for a response that is gracious and humorous, if possible. For example, the York Daily Record might have responded by thanking my sister for pointing out the error and by mentioning that it was fixed in the online version of the article (it was). It might have joked that the newspaper has a grammar expert, but that person had a bit too much egg nog over the holiday and just missed that one. There’s no reason not to be thankful. My sister cared enough about what was in her newspaper to take time and write a note. Everybody makes mistakes, and this was a relatively harmless one, so why not have a sense of humor about it? My purpose in writing about this, however, is not to deliver a lesson on how to use social media. Many businesses have trouble dealing with social media criticism, but this case is especially instructive about newspapers and their editors. I worked in the newspaper industry for 30 years, and I can tell you that most editors and writers hate mistakes. I can also tell you that the thing they hate more than making mistakes is having mistakes pointed out to them. There are some reasons for that. When it comes to spelling and grammar, for example, newspaper folk view themselves — with good reason — as defenders of the language. Not only that, by the nature of their business, journalists often write about the mistakes, errors, foibles and missteps of others. Stones thrown back at newspapers expose the glass house. Editors don’t enjoy that. When I got my first reporting job back in 1978, there were some newspapers that declined to run corrections when they made mistakes. Most others buried corrections on a page that was often overlooked, and rarely was a correction given the prominence of the original error. The institutional attitude about errors — don’t make them, and hide it when you do — is one of things that has hurt the industry’s credibility and contributed to its decline. 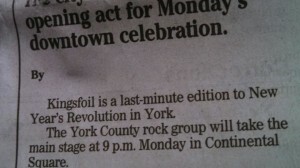 The York Daily Record’s Facebook response was yet another manifestation of that attitude, albeit a small one. The Internet age demands transparency and even rewards it. What does transparency mean? It means acknowledging mistakes. It means identifying sources and relationships when relevant. It means acknowledging the relationship you have with your consumer, or reader, in this case. It means inviting and accepting reader participation, even when it’s criticism. The attitude of infallibility (“We didn’t make that mistake. Somebody else did.”) is a giant liability for newspapers in the Internet age. 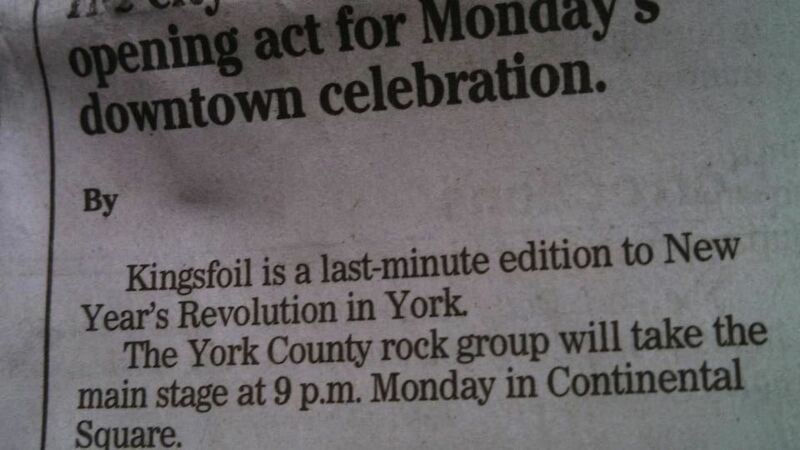 Even more disappointing with the York Daily Record example is that fact that the newspaper, owned by MediaNews Group, is operated by Digital First, whose CEO, John Paton, is the newspaper’s loudest advocate for pushing the industry into the Internet age. It’s one thing to advocate using digital platforms to tell news stories, but apparently it’s something else entirely to change the attitudes that have led the industry to sink in Internet quicksand. When I see something like the York Daily Record’s lame response to my sister’s Facebook comment, I see more than just one simple social media conversation gone bad. I see yet another example of why an industry is failing. 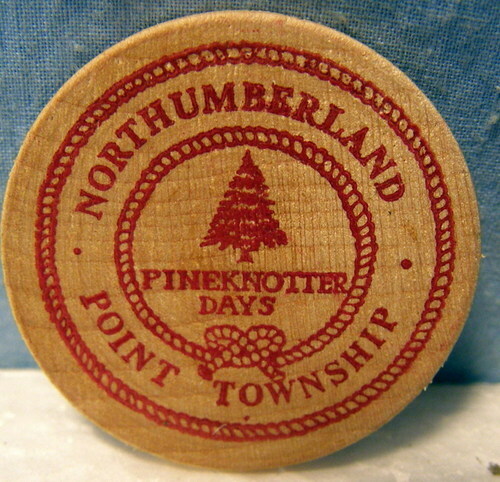 A commemorative wooden “nickel” made for a Pineknotter Days celebration in the early 1970s. You can buy it on eBay. When people ask why I became a journalist, I usually tell them I was a “Watergate baby,” part of a flood of young people influenced by the Washington Post reporting that led to the resignation of President Richard M. Nixon in 1974. It was a compelling story and inspired dreams of investigative reporting that would expose corruption and lead to a better world. My reality remained more in the world of community journalism, however. I never was much of an “investigative” reporter, but I was good at explaining and describing events, whether it was a school board meeting, a high school football game or a murder trial. My newspaper career started at a small newspaper in Sunbury, Pa., along the Susquehanna River about 50 miles north of Harrisburg. Along with the usual meetings, police reports, fires and accidents, reporters at small newspapers spend a fair amount of time writing about and taking pictures of community events, festivals, carnivals, graduations, school plays and all manner of “non” newsy stuff. A former colleague, John L. Moore (@johnleonmoore), reminded me the other day how important the coverage of those small events can be to the people who are involved. John, who was my city editor and managing editor at The Daily Item, still lives in Northumberland, a town across the North Branch of the Susquehanna from Sunbury, He attended a viewing for a neighbor a few weeks ago and sent me a note to tell me about a photograph he noticed among a group of pictures of the deceased. It was a newspaper clipping of a photo taken in the late ’70s. It showed John’s neighbor helping to set up the King Street Park for Northumberland’s annual Pineknotter Days festival. The photographer? Me. John’s note touched me in a way I would have never expected 35 years ago, when I probably grumbled that the assignment wasn’t “real” journalism. Now I find myself grateful that I captured an image, a moment, that somehow represented something important in this person’s life. I used to tell people that the journalism we did at small newspapers was just as important to our community as the journalism the New York Times did for its community. I was right, but I didn’t understand why until now.